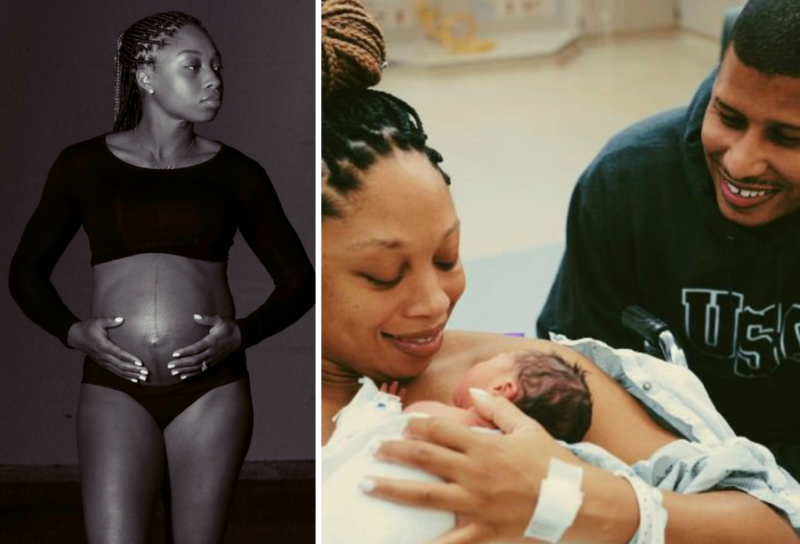 Allyson Felix, the most decorated U.S. Olympics woman track and field star with nine Olympic medals, secretly married and had a baby last month. She revealed the news in a feature published Thursday at ESPNW, where she also explained, like the scrutiny and judgment Serena Williams felt, she felt pressured to put off starting a family so not to jeopardize her athletic career. She married long time boyfriend and fellow Olympic sprinter husband Kenneth Ferguson, got pregnant and at just nine weeks along, competed in a race and again at 4 months but both times, she ran noticeably slower. “When I ran back-to-back slow times this June, people started to wonder why. My coach talked to me about shutting it down for the season. My brother wanted to make sure I wasn’t hurt. It was time to tell them what was really going on. The baby, a little girl she and hubby named Camryn Grace Ferguson, came early at 32 weeks via emergency Caesarean section and is still in the NICU. Felix shared some of her birth story and anxiety over motherhood in her Twitter account including her reaction to being told by doctors at her 32-week check up that they didn’t like the baby’s heart rate and to go to the hospital. I’m an athlete. I know how to take care of myself. I know how to eat right and get enough rest. And I’d been doing everything right throughout the whole pregnancy. When I got to the hospital, I knew pretty quickly that something was very wrong. Felix had high blood pressure and the baby’s heart rate decelerated, forcing an emergency C-section on Nov. 28. Camryn was born 3 pounds, 7 ounces and 16 inches. She was immediately taken to the NICU, where she still is being cared for three weeks later. Felix said her daughter is doing well and will be OK.
She is telling her story now to be open and transparent over the fact that famous people, including athletes have the same struggles as most women. “Pregnancy in sports shouldn’t feel risky,” she tweeted. “[B ]ut the reality is that it is. It’s scary to tell an employer you are starting a family & not know if you will be supported.